The PTA raises money to support educational enrichment at our schools through various fundraising activities. How are the funds raised by the PTA used? New water fountain at the Glen. 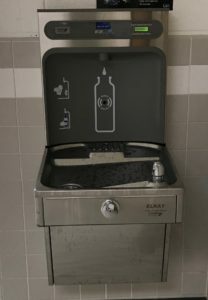 During the 2017-18 school year, funds raised by the PTA were used to purchase and install five next water fountains/bottle filling stations (four at Kings Glen and one at Kings Park). In addition, PTA funds were used to install new projectors at Kings Park. In October 2018, new flexible seating was delivered to the Kings Park Library. The various seating options provide students with comfortable places to read and allows for easy reconfiguration for pairs, small groups or entire class discussions. Special Vote projects – past projects include Realizing the American Dream program, laptops at Kings Glen, Teacher’s College staff development at Kings Park, additions to classroom libraries, and the take home reading program. Transportation for school field trips. In 2017-18, the PTA funded the buses for all of Kings Glen’s field trips. Support KPKG PTA while you shop!